The Thunder Hill Ski Area is a winter wonderland for skiers and snowboarders alike. 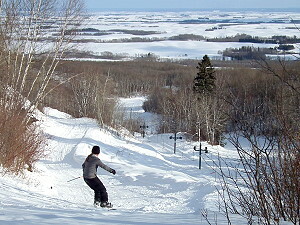 The ski hill features over 22 groomed downhill ski runs as well as a snowboard park. The longest runs are almost 3/4 mile with 400 foot vertical. The area is serviced by two T-bars and a chalet with a concession as well as ski and snowboard rentals. For those who prefer a little less excitement, sleigh rides are also available. 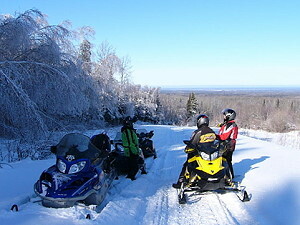 The Swan Valley has over 800km of award winning snowmobile trails and we never seem to lack for snow! Our exceptional trail system is groomed and maintained by our two local snowmobile clubs, North Mountain Riders and the Swan Valley Snowmobile Association. From flat running fields to scenic forest areas and breathtaking outlooks, there is opportunity for all kinds of adventure. Strategically placed warm-up shelters provide welcomed rest stops. The Swan Valley is sled friendly with many trailside hotels, motels, restaurants and fuel stations. 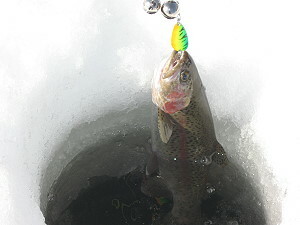 Ice fishing is a popular way to enjoy our lakes during the winter season and many weekends feature ice fishing derbies as well. The “Go Fishing” page on the Swan Valley Sport Fishing website has more info. Snow shoeing and cross-country skiing are other favorite ways to explore our winter wonderland. Far enough north and away from the lights of town, the Aurora Borealis (Northern Lights) can often be seen at night dancing across the prairie sky.